Morning one and all and welcome to another weekend. One in which we have to wait until Sunday – once again – before we get to see The Arsenal in action. Still, at least we have some interesting titbits of information to digest, starting with the Europa League draw. Never underestimate the power of the Europa League to throw in a team for which this time last week you didn’t even know existed. And so it is that the mighty Vorskla will be our opponents in this season’s group stages. Currently sitting eighth in the Ukrainian league, it’s not so much the quality of the opposition that is slightly concerning, but the fact that the Arsenal players will be visiting a country still rocked by civil war. Add to that the fact that we have to travel to literally the farthest corner of Europe to play FC Qarabag, and quite frankly it’s a draw that we could have had a little easier on ourselves. Sporting Lisbon might be a nice trip in October though. 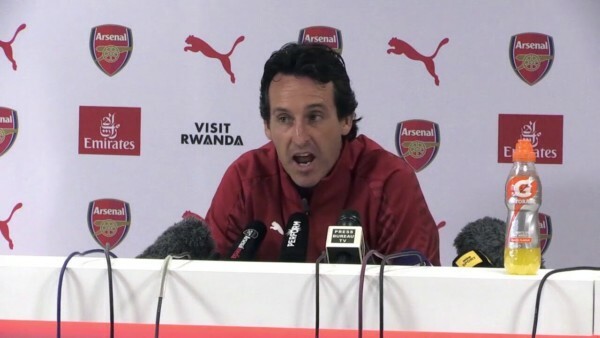 Emery had his press conference yesterday and as you’d expect he said that the three teams will be well prepared for by Arsenal and with a man known for his methodical approach to football games you’d expect nothing less. However it’s a group Arsenal should be winning and winning well and it’s a group in which you’d expect there to be plenty of rotation. Emery has already said that and we all know it’s the right approach. We can’t have the same players playing away in Baku on a Thursday, then travelling back on Friday and being as sharp for a Sunday game, so rotation will certainly have to take place. Emery also gave us an update on who’s fit for tomorrow’s game at Cardiff and quite frankly, he must be getting bored of the constant comments about Mesut Ozil from the press. I know I certainly am. He confirmed he’s fit and available for selection this weekend and you’d expect that would be pretty much it. But some of the outer press will keep turning the screw until there’s no give left and so they probed Unai a little on the situation. At this stage we have to say the situation is pretty clear: Unai and Mesut had a chat, Mesut was ill, Mesut is now better, he can play this weekend. It’s all a little tedious but I’m hopeful he plays this weekend and plays well, because it will get the press of this boring topic. The other news coming out of yesterday was the transfer deadline day move for Reiss Nelson to Hoffenheim, which was followed by confirmation that he’s signed a new three year deal, with an option for a fourth by the club. I have to say this is fantastic news. He’s one of the brightest stars to come out of the academy but as Unai said yesterday in his presser it is important that he plays. I kind of understand those of us who wanted to see him in the Europa and League Cup, but if Nelson plus 30 times for Hoffenheim this season and even gets a taste of Champions League football, then he’ll come back to The Arsenal a much better player than the one that left. Just think about what Nagelsmann did for Gnabry and look at his trajectory he faced after joining the German team. Now imagine that instead of being forced to sell Gnabry because he had a year left on his deal, we got to keep him. Wouldn’t that have been a preferable option and wouldn’t we all have liked to have seen the German playing for us right now? Hopefully that situation was one of the driving forces behind getting Nelson signed up before leaving and now we all have a very vested interest in seeing Hoffenheim do well this season. But Nelson has to show he’s worthy of minutes so it’s on him now to prove he can do it. He’s been given the number nine shirt so he’s clearly a player that Nagelsmann likes and wants to see get plenty of game time. That’s the first positive sign. The injury news appears to be that there isn;t really any other news. Kolasinac, Maitland-Niles and Koscielny are all still out, so we won’t see them, so I expect to see a similar line up tomorrow to the one that played against West Ham. We’ll just have to see though because one of the exciting things about Emery’s Arsenal is that we have absolutely no idea who will play and how we’ll set up. Hopefully with Torreira tomorrow but i’ve kind of done my piece on that this week so I think I’ll give my predictions on the line up tomorrow. Catch you all later peoples.